Migratory birds live complex lives—spending parts of their year in places hundreds or thousands of miles apart and in different habitats. Ornithologists face challenges at least equally complex in their study of these far-ranging and fleeting creatures. So it should not be surprising that they find ways to collaborate … and to migrate great distances in is this pursuit of understanding. 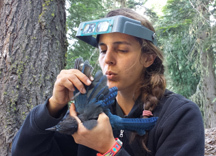 Klamath Bird Observatory has long recognized the value of international engagement. Since 1999 we have worked to build the capacity of like-minded individuals, organizations, and networks dedicated to the conservation of the birds we share. Through our international internships, training workshops, partner bird observatory support and mentoring, and collaborative network participation, we plant seeds and help grow bird conservation efforts that have taken root all over the world. KBO has hosted 54 interns from 17 countries over the past 20 years. 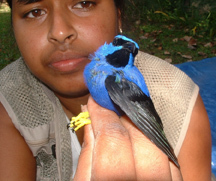 Many of these individuals are now engaged in careers that are creating exchange opportunities for information and training, and participating in international bird conservation organizations, partnerships, and networks. Our high-impact training opportunities have been possible only through partnerships with the US Forest Service International Programs, Oregon State University’s and Southern Oregon University’s International Programs, National Park Service’s Park Flight Migratory Bird Program, and with KBO member donations. KBO biologists have completed migrations as instructors to banding training workshops in nine countries outside the US—gatherings where we have met many of our interns and partners. And KBO is a close partner with bird observatories in Brazil, Costa Rica, and Mexico, and an active partner in several international information networks. 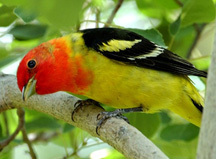 One of the collaborative networks in which we are closely involved is the North American Bird Conservation Initiative. Their current newsletter features the article “The Value of International Engagement for Birds and People” by Environment for the Americas ornithologist Carol Beidleman. The article highlights the considerable achievements and wide-ranging impacts of the NPS Park Flight Migratory Bird Program. Migratory birds live their lives oblivious to the borderlines people have drawn all over the world. As scientists and conservationists, we need to continue in finding ways to freely exchange information, ideas, and people across those lines to better understand and so more effectively help these international travelers—our foretelling ‘canaries in the coal mine’ for environmental well-being. CLICK HERE and HERE to view collections of previous Klamath Call Note posts about our international capacity building programming. CLICK HERE to view the North American Bird Conservation Initiative’s Important News from the U.S. NABCI Committee article “The Value of International Engagement for Birds and People”.